Excellent employment outcomes are one of the hallmarks of a Kalamazoo College education. “More in Four, More in a Lifetime” is a way of life for alumni who benefit from the career networks they first establish at K.
Kalamazoo College students start preparing for employment in their first year on campus when they are introduced to a four-year career exploration plan. Then, with innovative programs such as K-Treks, 91 percent of our job-seeking students from the Class of 2018 responding to our surveys reported they had found employment within six months of graduation. Thanks to generous alumni and friends of the College, K students can benefit from employment outcome offerings such as K-Treks. 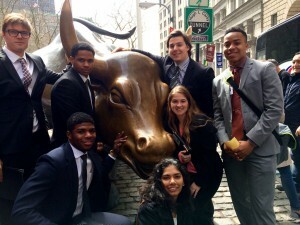 Emerson Brown (counter-clockwise from upper left), Joshua Vance, Christopher Francis, Kriti Singh, Shelby Hopper, Dylan Calloway and Ryan Andrusz participated in this K to the Big Apple trip to New York City. 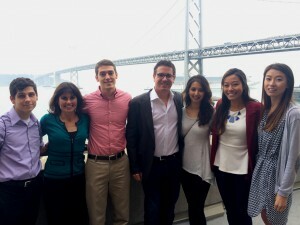 K-Treks were established in 2014 by K alumnus and TechValidate co-founder Brad O’Neill ’93, who invited four students to San Francisco to learn firsthand about technology careers. Since then, K-Trek programs have grown and expanded to New York City and Chicago, providing students with hands-on, outside-the-classroom opportunities. As a result, they learn to network and discover their prospective careers. Handshake, the leading career platform used by over 200,000 employers, delivering a database of career-development opportunities including internships, campus jobs and thousands of entry-level, post-graduate career opportunities. Passions to Professions events, providing lunches where students share a casual meal with a visiting professional and have opportunities to learn more about a career path. Recruiting expos, involving an evening with employers and graduate schools and sessions led by recruiters. The K alumni network, extending opportunities such as Wisr, the Kalamazoo College Career Mentoring Network. Wisr is an exclusive, career-focused online platform where alumni offer advice and connections to K students, helping them prepare for Life After K.
Kalamazoo College alumnus Brad O’Neill ’93 (center) welcomes K students to San Francisco through the K-Treks employment outcomes program. A great return on investment. Forbes rates Kalamazoo College one of the top institutions in the nation for return on investment based on post-graduate success, student satisfaction, student debt, academic success and graduation rate. Outstanding achievements from higher levels of learning. Kalamazoo College seniors perform in the 96th percentile on the Collegiate Learning Assessment, which measures critical thinking, analytical reasoning, problem solving and written communication skills. Life-changing experiences. 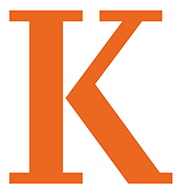 Kalamazoo College has been featured in all four editions of “Colleges That Change Lives: 40 Schools That Will Change the Way You Think about Colleges,” a book that profiles extraordinary colleges and encourages students to select institutions based on fit. What will you achieve at K and beyond? Apply to Kalamazoo College and find out!